Warning!!! This is going to be picture heavy post. This post was long overdue. 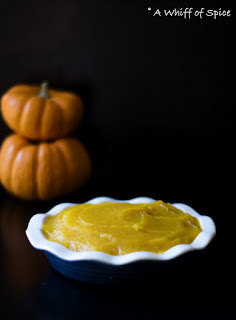 I have been making my own pumpkin puree for a long time now. Don't get me wrong, I love the canned stuff. I use it all the time and it is really really good and handy thing to have in your pantry. But every now and then, the domestic goddess in me rises. I get this huge urge to do everything from scratch - grind my own spices... make my own ghee... make pesto and marinara from scratch... make own extracts, make pumpkin puree.... you get the idea! With all the pumpkin galore in the grocery store now, it is hard to resist the temptation of grabbing a couple of cute little sugar pumpkins on your way out. Believe me it really easy. It took more effort to click the pictures and write this post than it took to actually roast and puree the sugar pumpkins. It all starts with gorgeous sugar pumpkins. Since I planned to make a huge batch, it picked 2 pumpkins, 3 lbs each. Give it a good rinse to remove all the dirt and girt and pat dry with a paper towel. Cut it into half. 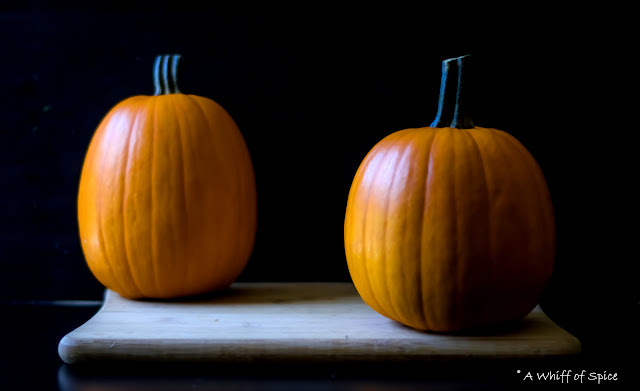 If the pumpkin is too big, cut it into quarters or even smaller wedges. Take out icky stuff on inside. Use a sharp spoon to scoop out the seeds and the stringy fibers. Do not discard these. I'll show what to go with then in a future post. 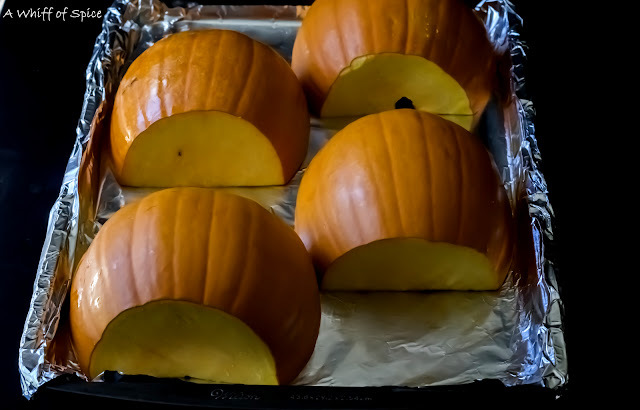 In a large aluminium lined baking sheet, arrange the pumpkin half, flesh side down. Since I wanted to have basic puree that I can use in either sweet or savory dishes, I did not add any seasoning while roasting. In case you are doing it for a specific recipe, add spices or seasoning accordingly. Bake in a 350F oven for an hour till the flesh is fork tender and the skin is charred. Let it cool. Peel off the charred skin. It will come of easily. I have noticed that it is easier to peel, the charred skin while the pumpkin is still slightly warm. Not scalding hot but warm and touchable. Now we puree the sweet, roasted Pumpkin flesh. 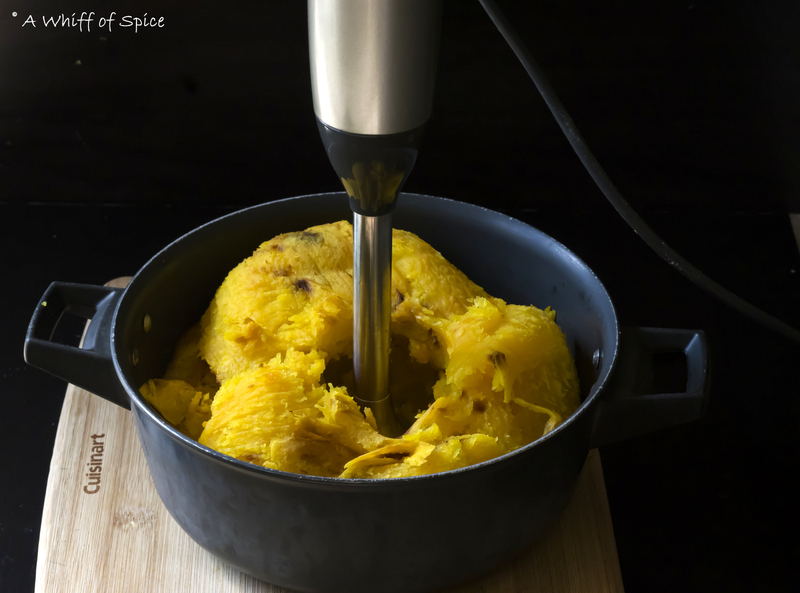 You can either use a blender, food processor or an immersion blender to do the job. Usually I do small batches and my immersion blender works just fine. But for a bigger batch I would recommend a food processor. 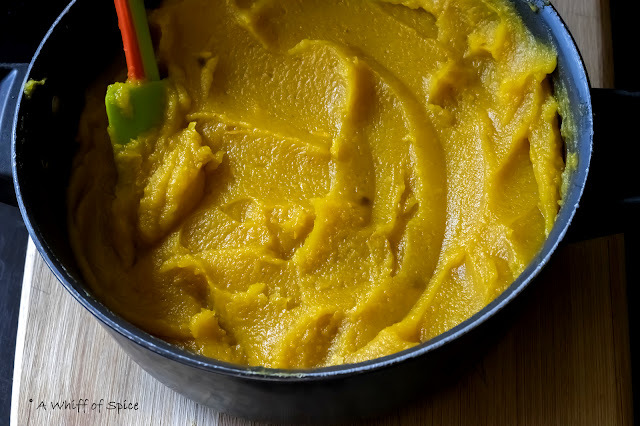 The gorgeous orange Pumpkin Puree is ready to make it way into your cookies, bread, muffins, soups, chili, pasta sauce and in so much more recipes! 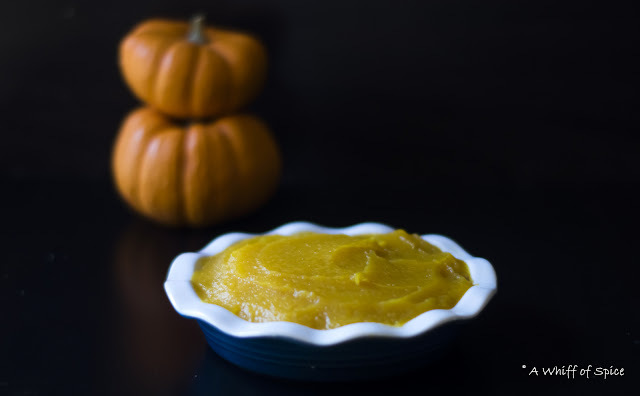 This recipe makes about 8 cups of Pumpkin Puree. I store them in freezer Ziploc baggies. I spoon in 1 cupful of Pumpkin Puree into each Ziploc and try and squeeze out as much air as possible. I store them flat in the freezer. Depending on quality of the pumpkins, homemade Pumpkin Puree can be a little watery, at times. It is perfectly fine to use in soups, chili or sauces. However, if you are planning to use it for baking, let the excess liquid drain out. Line a mesh strainer with cheese cloth and place it over a large bowl. Dump the puree into the strainer. Let the excess liquid drain out, overnight in the fridge. 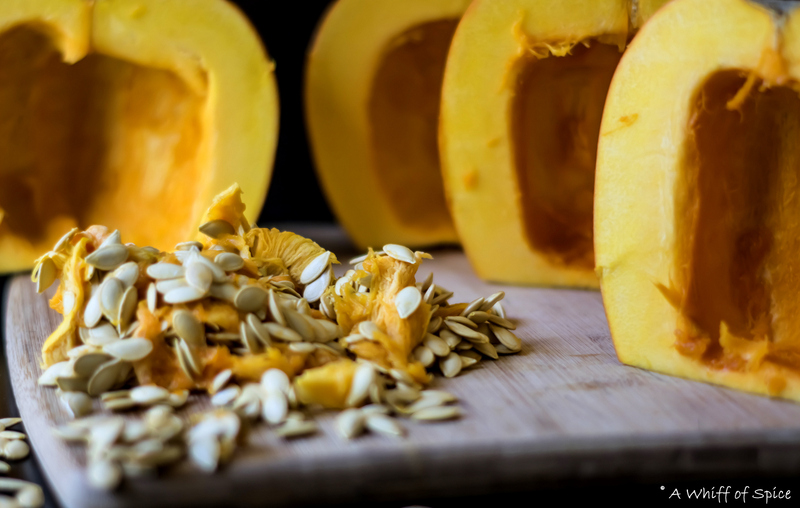 Pumpkin is an extremely nutrient dense food. It is chock-full of vitamins and minerals but low on calories. There are so many creative ways pumpkin can be incorporated into your diet. 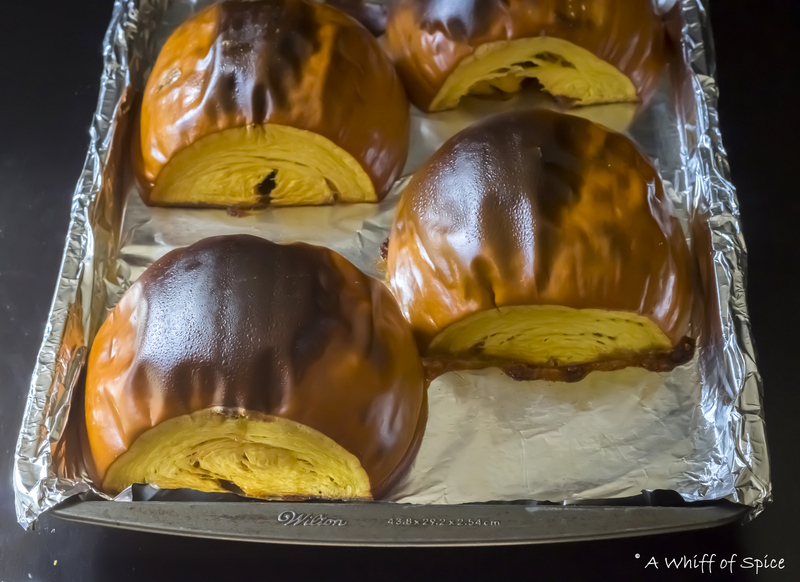 Here are few of my favorite Pumpkin recipes. 2. Give the pumpkins a good rinse to remove all the dirt and girt and pat dry with a paper towel. 3. Cut it into half. If the pumpkin is too big, cut it into quarters or even smaller wedges. 4. Using a spoon , scoop out all the seeds and clingy fibers. 5. In a large aluminium lined baking sheet, arrange the pumpkin half, flesh side down. 6. Bake it in a 350 F oven for an hour till the flesh is fork tender and the skin is charred. 7. Let it cool. Peel off the charred skin. It will come of easily. 8. Either using a blender, food processor or an immersion blender, puree the pumpkin flesh, till smooth. 9. 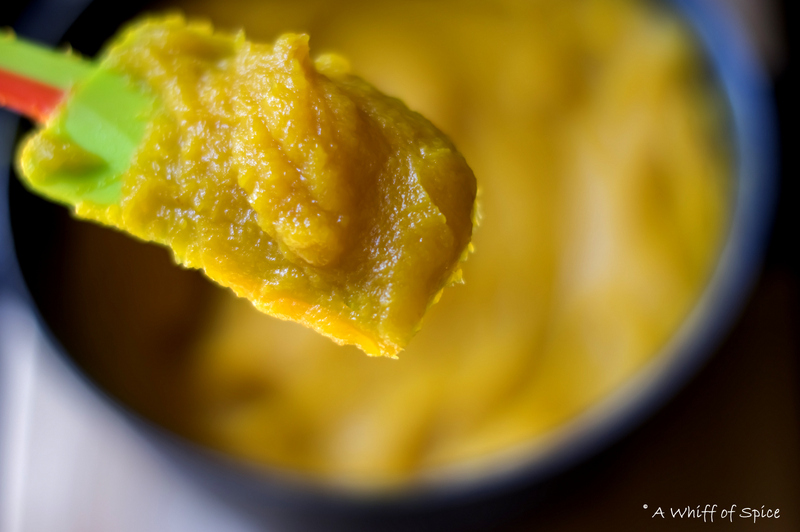 The gorgeous orange Pumpkin Puree is ready to make it way into your delicious recipes! 10. Use it immediately or store in the freezer in Ziploc baggies. Notes/Tip: Depending on quality of the pumpkins, homemade Pumpkin Puree can be a little watery, at times. It is perfectly fine to use in soups, chili or sauces. However, if you are planning to use it for baking, let the excess liquid drain out. Line a mesh strainer with cheese cloth and place it over a large bowl. Dump the puree into the strainer. Let the excess liquid drain out, overnight in the fridge. Here are some key points about pumpkin. 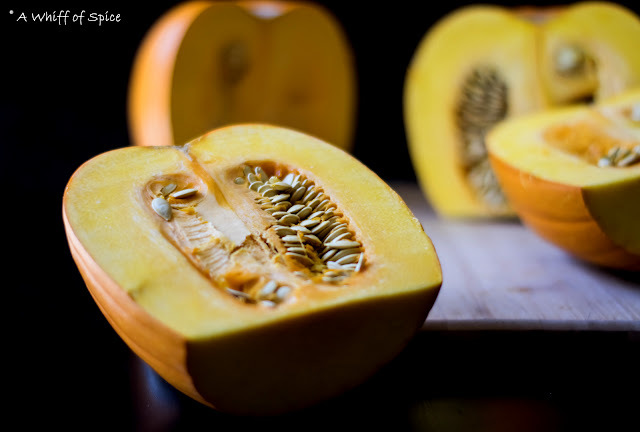 Pumpkin is a rich source of vitamin A.
Pumpkin is one of the best-known sources of the antioxidant beta-carotene. The antioxidants and vitamins contained within pumpkins could prevent degenerative damage to the eyes. Canned pumpkin contain just pumpkin and no other ingredients. 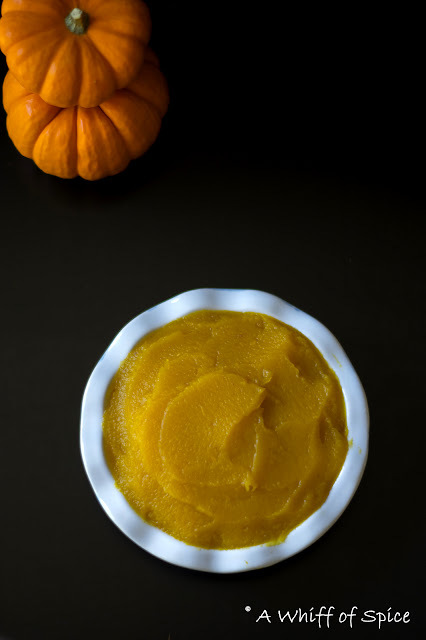 Homemade Pumpkin Puree looks so smooth and very well made, good to see these types of things which makes your life more easier and can help you with the cooking stuff. Thank you! It's easier than I expected! Why we have to buy pumpkin puree when we can homemade! Thank you for the recipe!! I guess I will have pumpkin pie after making this!